Puzzled to see another book review so soon!? Well, a book review always doesn't mean that I have FINISHED the book and that too so quickly. It may even mean that I have given up further reading, but as a ritual I am penning down my views. I found out this Bestseller and 1997's "Booker Prize" winner book at the start of this month on Goodreads here. With a whooping 7343 reviews and 151237 ratings, this occurred to me as something I can invest upon. I ordered it then, and after eagerly waiting for long (including Diwali vacations), I received it a few days back. 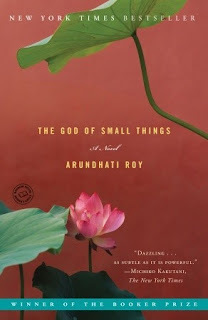 I don't know much about the author- Arundhati Roy, but upon reading some of this book I presume she is a great scholar in English literature. If these many people have read and reviewed the book on the planet, there is no second thought for it to be called a masterpiece. But for me, I could not bear with the flooding number of characters and holding the dictionary in the other hand to decrypt the powerful vocabulary. The South Christian from around 1960s, was what I could not relate to at all. It gave me gloomy feeling. The story hopped from one character's back story to the other. I tried hard to interpret the vocabulary contextually and to understand the characters' perspectives. Amusingly (and to my embarrassment), as soon as I switched to the consecutive paragraph, the previous one was wiped of from my memory. My patience couldn't survive for more than 52 pages, and I gave up. Not only me, I later heard from some other friends that they are also sailing in the same boat as me! May be one day my intellect would grow up and I would again open up this book to finish upto the last page. Till then, all I can say is, there is a difference between what is the best and what is suited for you.